KAMENSK-SHAKHTINSKY, Russia -- Hundreds of trucks in a Russian aid convoy waited Saturday near the Ukrainian border as complicated procedures drag on for allowing them into eastern Ukraine to help civilians suffering amid fighting between Ukrainian forces and separatists. 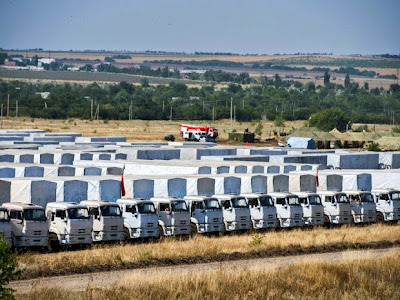 Trucks of Russian "humanitarian convoy" are parked in a field outside the town of Kamensk-Shakhtinsky in Rostov region, some 30 km (19 mi) from the Russian-Ukrainian border, Russia, on August 16, 2014. Ukrainian officials are concerned that the mission including around 200 trucks could be a guise for Russia to send in equipment for the rebels, whom Kiev and Western countries claim are backed by Moscow. But Russia and Ukraine reached an agreement under which the trucks could enter with Red Cross accompaniment if Ukrainian border guards and customs agents approve the cargo. A representative of Russia’s Emergencies Ministry, who declined to give his name, told The Associated Press that documents about the cargo have been given to Ukrainian border guards and customs officials who have come to the Russian border town of Donetsk for the cargo inspection. But Colonel Andriy Lysenko, a spokesman for Ukraine’s national security council, told reporters in Kiev that as of mid-day the Ukrainians had not received documents from the Red Cross about what is aboard the trucks. Fighting continued in eastern Ukraine and Lysenko said three Ukrainian servicemen had been killed in the past day. He reiterated the claim made a day earlier by President Petro Poroshenko that Ukrainian forces had destroyed most of a column of Russian military vehicles that had entered eastern Ukraine on Thursday evening. Russia sharply denied that any such incursion had taken place and the White House said it was looking into what it called unconfirmed reports that Russian military vehicles were destroyed. Nonetheless, the reports spooked global markets and overshadowed optimism about the aid convoy. While the Russian aid convoy remained stalled near the border, Ukraine has mounted a smaller but substantial aid mission to parts of the east recently freed from rebel control. Trucks sent from the eastern city of Kharkiv were unloaded Friday at warehouses in the town of Starobilsk, where the goods were to be sorted and transported further by the Red Cross. Starobilsk is 100 kilometers (62 miles) north of Luhansk. Other Ukrainian aid was taken to the town of Lysychansk, which retaken by Ukrainian forces late last month but has seen sporadic clashes until earlier this week. The foreign ministers of Ukraine, Russia, France and Germany are expected to meet Sunday in Berlin to discuss the crisis. The fighting in eastern Ukraine has claimed nearly 2,100 lives, according to the U.N. — half of those in the last few weeks as the Ukrainian troops regained more and more rebel-held territory. It began in April, a month after Russia annexed Ukraine’s Black Sea peninsula of Crimea.